Damn. Having a new problem that started early Monday morning. One of my previously healed surgery incisions, the one on my side by my ribs, opened up and started bleeding again. Needless to say, I'm pretty impressed with WrongDiagnosis.com and its attention to religio-mystic grammar, even though it didn't provide any treatment options. UPDATE: I stayed up too late last night and watched "The Endurance," a documentary about Ernest Shackleton's 1914 expedition to Antarctica. I've read so much about the golden age of exploration that I should have recognized what is happening to me as a symptom of scurvy. So, I've got it narrowed down to either stigmata or scurvy. Hey, that's not any more crazy than anything else that's happened to me.... I will replenish the vitamin C sources in my ship's stores to address the scurvy. 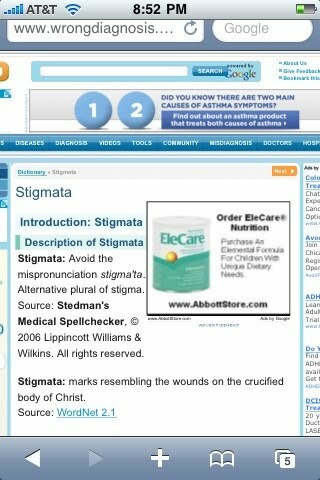 Not sure how to deal with stigmata. Took the kids tonight to see Lakeland College's production of Chicago. Really fun, they did a great job. I love Lakeland events. However, both kids had sleepovers last night and were very tired, so we snuck out about 2/3 of the way through the show. Yes, Chicago has some adult(ery) themes that might be a bit much for kids, but it is art. I try to shield them, to an extent, from vapid nastiness, but they also need to be exposed to the classics, and I'd rather be with them so I can explain things and provide moral context. And heck, you see worse things on promos for TV shows or movie trailers on TV. You can't avoid it all, you have to deal with it. Sammy thought the "he ran into my knife--10 times" line was pretty funny. He was raised on Tom and Jerry. Much more violent than Chicago. Gaby dressed up for the show, looking fabulous as usual. The set up: In each episode, Phineas and Ferb build fantastic contraptions in their backyard, but the contraptions somehow disappear or are destroyed before the parents can see them, which drives the older sister crazy, as the parents don't believe her. So she decides to sit and watch their latest invention to make sure it doesn't go away. Phineas and Ferb sing about it. Anyhow, I give you "We're Watching and Waiting..."
Despite my emails to various Antarctic research organizations (yes, I did that), still no hits on my blog from the elusive seventh continent, Antarctica. 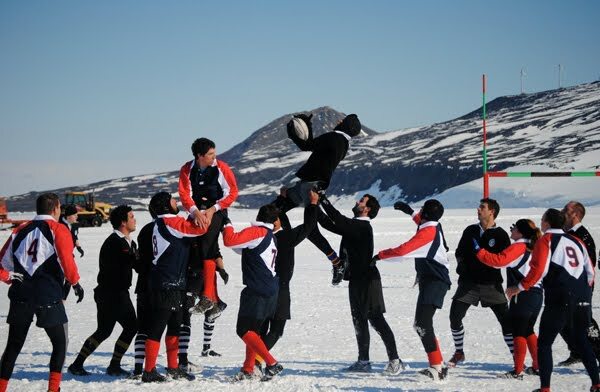 I must be approaching it wrong, I should play up my love of rugby. At the foot of an active volcano 900 miles from the South Pole, Tom Leard leads a fearless band of men and women over a battlefield of frozen sea, beneath a relentless sun. Ash billows out from the peak behind them as they approach their enemies, who stand staggered across the barren stretch of ice, clad in black from head to toe. 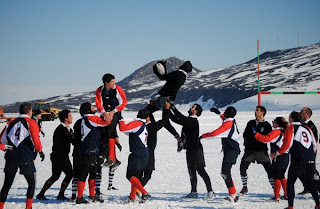 Here, on a January day in Antarctica’s frozen McMurdo Sound, Leard and company have come for the latest installment of a decades-long tradition: A rugby match, played between the American and New Zealand research bases, on a field of sea ice 10 feet thick.... (full story here). Tired of waiting for my first post-op scans. 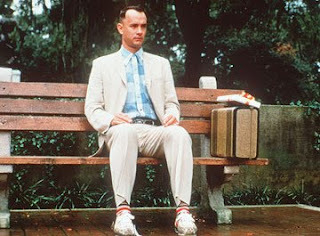 Going to entertain myself by posting songs about waiting. The first one is by Jack Johnson. Thanks for being there for me! The picture above was taken on Dad's birthday, today, but in 1943. 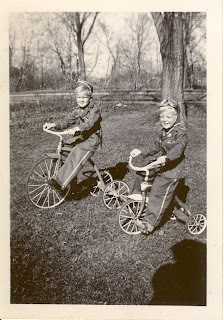 He's on the left on the big trike, his little brother David is on the right. Looks like they are supporting the troops! 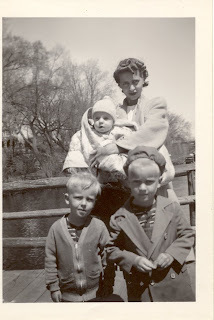 The other picture is also from 1943, and includes a baby Uncle Terry, too. Two of my cancer buddies are having big surgeries, one today, and the other on Monday. Please send them good vibes! They have both, unfortunately, been through this before, so at least they know what to expect. That doesn't make it that much easier on them emotionally, though, I'm sure. 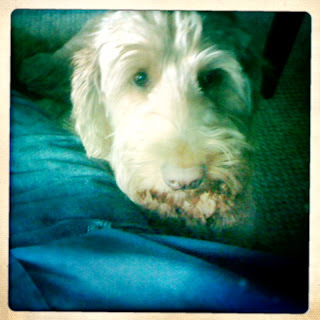 Dogs know when you aren't feeling well. I was cleaning up my photos and ran across this, from about a week ago when I was resting up. She sticks by my side, and often tries to climb on the sofa with me. Below: My brother sent me one of his backpacking tents (yes, plural--he is a gearhead). Took me a bit to figure it out without instructions. Gaby and I are going on a real backpacking trip this summer, walking in to a remote campsite up north. Should be a great experience--totally off the grid. No cellphones, stupid text messages, or tv. I'll take Sam on an easier remote camping experience, Rock Island (Door County) which we did a couple summers ago already. They need to detach from electronic gear every once in a while. Such a peaceful phrase, very relaxing. Kinda like yer hangin' out, sprawled on a park bench in the splotchy shade of a leafy oak tree, enjoying a tasty snack, studying people and chatting up strangers. Just biding your time.... Nice. Yes, of course, I'm setting you up for a twist with that introduction. For those with cancer, whether it's PMP or one of the lesser varieties (I kid! ), "watching and waiting" is a typically stressful period of not knowing what's next, and I think primarily occurs when you are not currently scheduled for some definite treatment such as surgery, radiation, or chemo. Right now for me the "waiting" is letting some time pass to see if the alien goo cancer returns and, of course, waiting to go see the doctor. The "watch" is the CT scan and check up once I get back to the doctor, I guess. My various tests and CT scan are set for a Tuesday morning in April, then I have to wait some MORE, as I do not receive the results until late in the day on that Thursday. It's hard to get all that out of my mind--this first check up visit in particular, and having to do this for the rest of my life. Sigh. Yes, I know: I should--and do--hope that I have plenty of CT scans in my future, decades of them, but a few years apart for each, you know? Nothing I can do but wait. And worry. And I can't help it, as much as I try. For example, at night in bed a sharp twinge in my side sometimes wakes me up. While the rational side of my brain tells me it is just pain from the surgery and it's to be expected while I heal, the irrational, middle-of-the-night side of my brain thinks it is another tumor, or the mucin. That pessimistic part of my psyche recalls the original pains I had, the cramps that eventually led me to visit a doctor in the first place, and that makes me think too much. Yeah, those are pretty bleak hours, when your brain is arguing with itself. When the sun comes up I feel sheepish for having those nighttime fears. Bah. There are plenty of us in this mode, to varying degrees, on the PMP patient website. So I shouldn't complain too much. Some of my virtual friends are watching and waiting to see whether they are candidates for a potentially life-saving operation or not, waiting to see if the mucin has softened or the tumors have shrunk far enough away from inoperable areas within their abdomen. Some are waiting to see if, after an incomplete cytoreduction surgery, the tumors will actually spread or not. Some are waiting for other things I don't want to talk about here. So, I'll wait. And I should be grateful for the opportunity I have. The cancer ends up smothering the organs when it grows too large. The appendix is a pouch-like tube that's attached to the first section of the large intestine or colon. The organ is about 10 centimeters long and is considered part of the gastrointestinal tract. Doctors believe the appendix may play a role in the lymphatic and endocrine systems. Appendix cancer occurs when cells in the appendix become abnormal and multiply without control, forming a tumor. Some appendiceal cancers produce mucus until they burst and shed cells in the abdominal or peritoneal cavity. Pseudomyxoma peritonei is another name for such cancers that produce large amounts of mucus within the abdominal cavity. These cancers can come from the appendix, colon or ovaries. Patients may have stomach pains or side pains that many times are mistaken for cramping or appendicitis. If the tumor is small when discovered, a standard appendectomy may be the only treatment needed. However, if the cancer has spread to the peritoneum, the membrane that lines the abdomen, the condition is much more serious. In this case, the cancer can coat the other organs in the abdomen, eventually suffocating them. In a few medical centers across the country, including Mercy Medical Center in Baltimore, Md., and the University of California at San Diego Medical Center in San Diego, California, surgeons perform a complicated two-part procedure to attempt to remove as much of the cancer as possible. The first part is called cytoreduction or debulking surgery, which removes the cancer in the abdomen. "We start cleaning organ by organ, trying to remove all the tumor while at the same time making sure with what we leave behind the patient will have a good quality of life," Armando Sardi, M.D., of Mercy Medical Center, said. "As you can imagine, there's tumor everywhere, so it's impossible to believe that a surgeon is going to be able to remove every cell, but we do the best we can. "After cytoreduction is complete, some patients may receive heated intraperitoneal chemotherapy, or HIPEC. Chemo drugs are heated to about 105 degrees and circulated over a 90-minute period through the abdominal cavity. Then the chemo is washed out. "Heat alone kills cancer cells, but also enhances the effect of the chemotherapy," Dr. Sardi said. "You obtain high concentrations of the chemotherapy in the area where the tumor is and very little gets outside." Heated chemo is circulated, then washed out. Recovery from this procedure can be brutal, including up to 12 days in the hospital and two months of recovery at home. "This is an operation and a treatment that has the potential for anything you can imagine, but the alternative is death," said Dr. Sardi. Check it out--had dinner at Pastor Jim and Pastor Julia's house the other night, and Jim had found this cool biking cap for me, since I want to get into biking. Get it? Jelly Belly. I love it. Despite that fact that Jelly Belly jelly beans are my favorite candy (tied with Mike & Ikes), I never made that connection. (For you non-PMPers, "jelly belly" is the colloquial term for having a belly full of gelatinous alien cancer goo.) Funny the things we are blind to, right in front of our eyes. Jim also got the same cap for our buddy Mark, another Sheboyganite with PMP, who, in an even greater coincidence, goes to Julia and Jim's church as well. Small world. 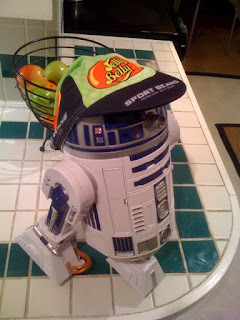 That's the kids' pet R2D2, modeling the cap. He does not bike. ...with this blog. As of today, almost 5,500 unique visitors have found their way to this site at least once. Over 1,800 different people (or at least different computers) returned more than once. 43 hits a day, on average. I can only see the cities and countries where visitors have come from, and they have come from every continent but Antarctica (I'm sure most if not all of these international visits are other PMP patients from other countries. I should send an email to some Antarctic research station and try to get a hit from there). I have also had four marketing firms send me form emails asking if I would like to get paid to host links on my blog for their clients (I must have passed some magical site traffic number, they all came within a couple of days of each other), but I deferred. I know, I probably passed up over a dollar. But I didn't get into cancer for the money, you know? I have had so much fun writing on here, sharing my descent into the volcano, and it was a great way to communicate with the outside world. But I don't get the gumption to write as much on this site these days. I'm trying to get back into the swing of things at work, and at life. Trying to climb out of that volcano. 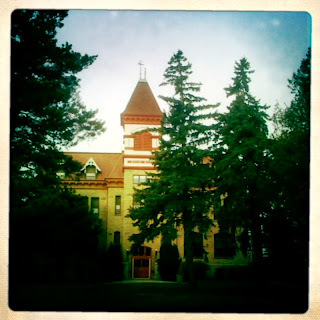 It would feel forced to write, here, without the intensity of the treatment process that I was going through. Things are different now. I need a new muse. I don't know, maybe I'll get the writing bug back. I'm sure I'll update this site with my next round of tests and CT scans in April down in Houston. Can't believe I have to go down there again so soon. I refuse to stay in the hospital's hotel again. Got nauseated just thinking about it. I'll find another hotel within walking distance. Nor will I eat in the cafeteria at the hospital. Neither were subpar, both were very good. It's just that after so many days trapped there before, I can't handle it again. Not this soon. Great to see all my friends again... My office isn't even all that dusty.